On request of a user who is using Texo with Vaadin, I spent some time on adding JPA annotation generation to Texo. It was already possible to generate an orm.xml (from an ecore model) using Texo but somehow Vaadin needed annotated classes to work with their JPAContainer. 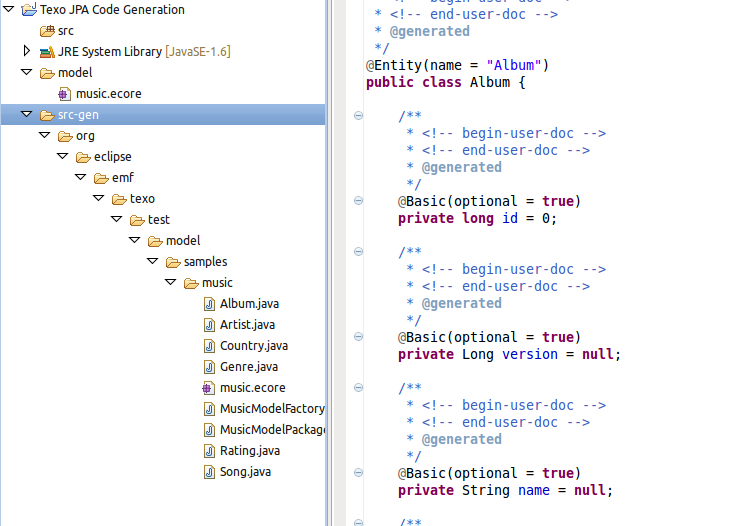 Now let’s see how JPA annotated code can be generated from an ecore/xsd, it is actually quite easy…. First install Texo from the update site here. That’s it! You can now persist your generated entities, make manual changes etc. If you need more control over the JPA generation you can annotate the model. I hope this is enough reason to try out Texo. The JPA generation is quite new (beta) so feel free to give feedback or ask questions on the EMFT newsgroup/forum.